Mea Vita: Carpe Diem: Why Have I Forsaken RSS? For years, I had been using Safari's RSS reader since that was my primary web browser. At least that was true until this past summer when Apple removed RSS from Safari. I was on vacation at the time so I only took a quick cursory look around the Mac App Store for a replacement. The best option that I found was Cappuccino, but it really didn't answer the mail for me. 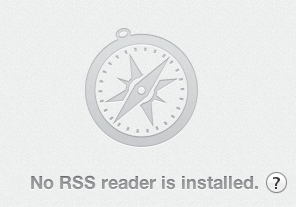 Since then, I took a look at RSS readers but none were as convenient for me as Safari's native RSS functionality. Firefox has a built-in reader and Google Reader is quite popular, but each requires the extra step of opening a different app or visiting a website. Changing my habits, after years of getting news the same way, is going to take a little work. Without explicitly realizing it I found that I was now getting all of my news updates via Flipboard on my iPad. Flipboard is nice in that you can point it at websites, Twitter, or RSS feeds using its search feed. The other beauty of Flipboard is that it presents news more like a newspaper or magazine rather than in a list format like most RSS readers. The downside is that Flipboard only runs on my iOS devices, so I still didn't have an desktop solution. So, now I'm wondering if this will be the progressive evolution of RSS? In the same way that most programmers no longer code in machine language or assembly, will RSS evolve primarily into a middleware layer, that's still important like a CPU's registers, instead of a feature designed for the average end-useing consumer?